In 1677, an invisible wall separates settlers in New France from their Huron neighbors. 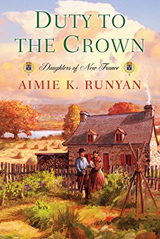 Yet whether in the fledgling city of Quebec or within one of the native tribes, every woman’s fate depends on the man she chooses—or is obligated—to marry. This book follows Manon, Gabrielle and Claudine who we met in the last book. All the girls are from different backgrounds but they all have their lives intertwined. Manon is back with the Lefebvre family after being cast out by her Huron village. Both the Hurons and the French treat her with suspicion. Claudine becomes to live with her sister at the Lefebvre mansion and has big dreams about finding a young, handsome and rich husband. Gabrielle works at her adoptive parents’ bakery and dreams about becoming a seamstress. I loved to see how the girls changed during the time. Claudine became from a silly girl into a devoted mother and realizes that she might have to lower her standards with life and getting a husband. Gabrielle went from an alcoholic and abusive father to an abusive husband but manages to change her life and finds love in her life. Manon finds her life between two very different worlds and found love and family. I really loved this book and I’m hoping there will be a 3rd book.